Most modern styles of tai chi trace their development to at least one of the five traditional schools: Chen, Yang, Wu (Hao), Wu, and Sun. At White Crane Online, we teach a rare White Crane tai chi form, originating from the Fujian province in south east China. In Chinese, the White Crane tai chi form is called ‘Shuang Yang Bai He Rou Ruan Quan’, which translates as ‘Frost and Sun White Crane Gentle Art’. The frost and sun part of the name is linked to the Taoist symbolism of yin and yang, which is embedded in traditional Chinese philosophy and culture. Yin (black) and yang (white) is represented by the imagery of the shady and sunny side of the mountain – the shady side being dark, cold and ‘frosty’, with the sunny side being warm and light. The white crane part of the name is simple – just like those of the white crane bird, the movements of this tai chi form are gentle, elegant and flowing, but also precise and stable with a subtle strength. The white crane bird is also a symbol of longevity and good health – these are also core benefits of practising White Crane tai chi regularly. 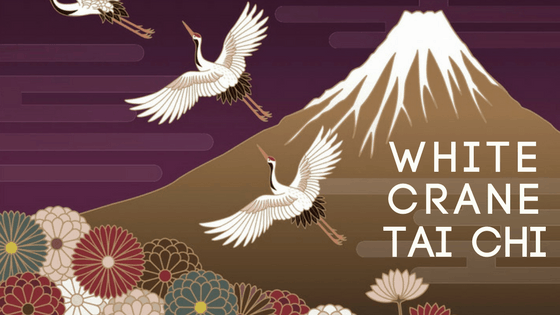 Despite having unique qualities, White Crane tai chi has similarities to three of the more well-known styles. The fluidity of movement is also characteristic of Yang style tai chi; some of the faster movements are found in the Chen style; while the smaller, more subtle movements are also seen in the Wu style. Legend has it that the White Crane style was created by a 13-year-old girl called Fang Chi Liang. As she hung out clothing to dry, a white crane bird attempted to steal some of her laundry. Despite her best attempts to shoo the crane away, she could not get anywhere close to it! Using deceptive footwork and effective blocking techniques, the relaxed movements of the bird allowed it to side-step Fang and swoop in to steal the clothing. Already part of a martial arts lineage (her father was a Shaolin Kung Fu master), she began to study and take on board the movements of the white crane, integrating them into her practice… and the White Crane style of Chinese martial arts was born. 0 responses on "The Rare White Crane Tai Chi Style"